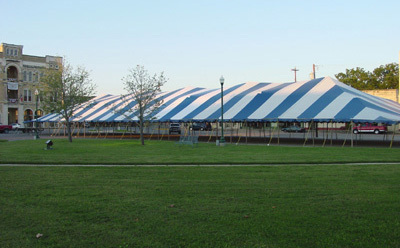 This Ultimate Party Tent by Premier is a fully functional tent kit that measures 60 ft. x 270 ft., and includes everything you need for your special backyard or business event. These Premier tents can withstand multiple set ups and take downs-and are tough enough for commercial and industrial use as well as at home. The heavy duty block-out top comes in either solid white, or white with translucent stripes, and features tough 2 in. seatbelt webbing around the perimeter and the poles are lightweight and durable, and come in a handy protective storage bag. For standing only, this can accommodate approximately 2700 people. For a seated event, this can accommodate about 1350. Please note that these numbers do not allow for a stage or service area.